British Upright Championship: 500cc First 2017, 350cc Second 2013, 2014, 250cc First 2018. British Pre 75 Championship: 500cc Second 2012, 350cc First 2011, 2014, 2015, 2016, 2017, 2018. Midland Centre Championship: Pre 75 First 2016, 2017. South Eastern Centre Championship: Uprights Second 2011, Third 2008, 2014; 500cc Second 1980, 350cc Second 1980, 1982, 1984. SE Centre Speed Shield Winner: Uprights 2009. South Mids Centre Championship: Pre 75 Second 2017. Battle of Britain: Uprights First 2009, Second 2010, Third 2015, 2017. Frittenden Flyer: Uprights First 2009, Second 2008, 2016. Jon Underwood: Two Valve First 2010, Pre 75s First 2011, 2013, 2014, 2015, Class 250cc First 2013, 2015, 2016, 2017, 2018, Second 2014. Ledbury Leader: Pre 75 First 2017, 2018, P350 First 2013, U350 Second 2013. Three Pairs Flyer: Second 2010. 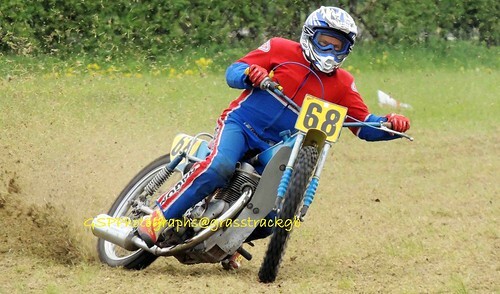 Wimborne Whoppa: 350cc Third 2012. 2018: First Maidstone, Fenland, Second SCA, Fenland, Third GWR; 2017: First Southend x2, Equal First Danebury, Second Bristol, Frittenden, Southend; Third Frittenden, Bridgwater; 2016: First Ledbury, Worcester, Fenland x2, Second Worcester, SCA, Third Fenland, SCA; 2015: First Fenland, Worcester, Southend x3, Second Fenland, Third GTSA, Frittenden; 2014: First Fenland, Wimborne, Frittenden, Bristol, Danebury, Second Maidstone, Bristol, Frittenden, Danebury, Third Fenland x2, Frittenden, Wimborne x2; 2013: First Ledbury, Danebury, Fenland, Midshires, Wimborne x2, Second Fenland, Frittenden x2, Third Fenland x2; 2012: First Fenland x2, Wimborne, Second Bristol, Fenland, Third Wimborne; 2011: First Somerton, Ledbury, Fenland x2, Southend x2, Third SCA; 2010: First Danebury; 2010: First Fenland, SCA, Second Fenland, Swindon, Maidstone; 2009: First Somerton, Swindon x2, VMCC, Fenland, GTSA, Second Maidstone, Swindon x2, Third Swindon, VMCC; 2008: First SCGTRA, Fenland, Third Dunmow; 2007: Third Fenland.